Home » BLOG » Drilling into brick or mortar? What you need to know? Drilling into brick or mortar? What you need to know? When people think of drilling, they usually think that it’s simple. You drill a hole, and that’s it. Drilling itself is very simple, but there can be a lot of additional stuff that you need to pay attention to while drilling, depending on the material that you plan to drill. We have compiled a list of five things that you need to know to make drilling into brick or mortar easier for you. What do you need to know when drilling into brick or the mortar? Regardless if you plan on to drill into brick or mortar, you should know that there is going to be a lot of dust everywhere. Most dust is going to get to the ground, but some of it will remain in the air for up to several hours. That’s why it’s best to drill when there are a few people around as possible. This is especially true for people that have breathing problems, like asthma. Here you can see how much dust there is when you drill into brick or mortar. Before you begin drilling, place some nylon on the ground directly below the area where you want to drill. Also, if possible, ask a friend or your wife to hold a dustpan below the place where you want to drill, as close as possible. That way, you will be able to catch most of the dust that falls below. Another, perhaps even better way of doing this is to use a vacuum cleaner. Remove the bottom part of the vacuum cleaner and turn it on. Place the tube below (or beside, if you are drilling on the ground) the drilling area and turn the vacuum cleaner on. You can start drilling, and the vacuum cleaner will collect all dust particles automatically. You should wear face and ear protection whenever you are drilling (Check on Amazon.com), but this is especially true if you are drilling into brick or mortar. The most important piece of equipment that you will need are the glasses, or even better, the visor (Check on Amazon.com). However, plastic goggles designed especially for this purpose are going to be enough to protect you from small pieces of debris when you are drilling. Mortar tends to get more dusty, while brick can shred into small pieces and fly away. That’s why I always use the visor. Since there’s going to be a lot of noise, get a pair of ear muffs (check on Amazon.com). A lot of construction workers I know don’t usually wear them, but I highly recommend that you use them. If you plan on drilling a lot, they will significantly protect your hearing. Another protective piece of equipment I highly recommend that you wear if you are drilling into brick or mortar is the dust mask (check on Amazon.com). They are very cheap and you won’t cough, or even worse, have breathing issues after you finish drilling. I usually only wear a mask if I am going to be drilling for a longer period of time. You don’t have to use a mask if you are going to drill one hole for a picture. This piece of advice goes for people that drill into walls to install cabinets or to place screws for picture frames the most, but there’s something to learn in this for everyone. Drilled mortar will decay and more and more parts will fall off after a couple of years. 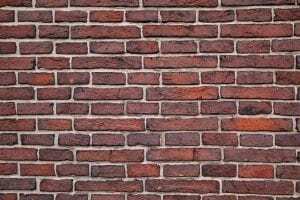 Brick, on the other hand, tends to be more firm and won’t deteriorate. However, when you are drilling bricks, you should be careful not to fragment them, and to drill them correctly. If you don’t drill a brick precisely, and cause a small fracture, there’s a risk that this fracture could become larger. Not using a hammer drill while drilling brick or mortar is a common mistake that I see beginners often make when they first try to do this. Although the market is saturated with many different types of drills, hammer drills are specifically designed for drilling brick or mortar. If you use a hammer drill like Black & Decker DR670 (you can buy on Amazon.com), a hole that you make will be a lot less prone to decay, and your work will be of higher quality. You will also be able to drill with more precision, as hammer drills often have handles that make it very easy to hold them steady, even during the most intense drilling sessions. There are many different accessories that will make drilling brick or mortar with a hammer drill, even more, easier for you. Don’t worry. It isn’t difficult to drill with hammer drills themselves, either. This is an issue that I see a lot of people does. If your nail or a screw ever fell off from a wall, you probably didn’t insert an anchor. Anchors should be tightly inserted into holes in order to, well, anchor themselves and the screw in the wall and prevent the screw from falling off. Since drilled holes are prone to decay, anchors prevent that decay and make placing the screw possible. Seriously, you wouldn’t believe just how many people don’t know this and insert screws directly into drilled holes. This is not so terrible if you do this for a hole where you want to hang a painting, but if you do not insert an anchor into the hole for your kitchen cabinet, you risk that the entire cabinet falls down from the wall. Anchors are easily inserted. All you need to do is to push them in the wall. An anchor should fit in tightly. Don’t drill holes that are too wide for anchors because there’s no point to insert an anchor then. I hope that this guide has broadened the horizon for you, as far as drilling into brick or mortar goes. If you follow this advice, you will have an easier time than most other people that do this, as these are the things that people most commonly forget to do while drilling. How to Sharpen Drill Bits with a File? How long does a home thermostat last? How to Connect Honeywell WiFi thermostat to a Network? What is a mixed signal oscilloscope?